Architects are now taking advantage of the computer in new ways through experimentation with algorithmic and simulation-driven design. 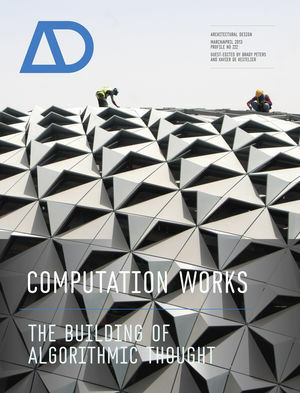 Computation Works: The Building of Algorithmic Thought focuses on this emerging theme in design practice, showcasing built and soon-to-be-built projects and providing a state of the art in computational design. Computational design is considered to be first a design tool, and second a series of instruments that can be applied in the creation of architecture. It allows architects to incorporate performance analysis and knowledge about material, tectonics and the parameters of production machinery. Moving towards a new role as hybrid practitioners, architects are taking concepts from other disciplines and customising architectural and other CAD software. In addition to the discussion of built projects, a further series of texts examines new custom software instruments. New digital tools provide new modes of representation, new methods of evaluation, and new techniques for design exploration. The development of new computational tools can create more responsive designs, allowing architects to explore new design options and to analyse architectural decisions during the design process. This issue raises important questions such as: How is computation changing the way architects design? Are the design tools and methods related to the result? What is computational design in the context of architectural practice? and How is computation changing the processes of design and construction? Xavier De Kestelier is Associate Partner with the Specialist Modelling Group of Foster+Partners, where he has worked on a broad range of projects such as Beijing Airport, the Yacht Plus BoatFleet and the Masdar Institute of Technology. Originallyfrom Belgium, he gained an MArch from the University of Ghent and an MSc (Urban Design) from the Bartlett School of Architecture in London. Since 2006 he has been visiting professor at the University of Ghent (Belgium) and Syracuse University (USA). He is a Director at SmartGeometry, an international group of academics and professionals who promote the use of parametric and computational techniques in architecture through conferences and publications. Brady Peters is an architect and researcher. Currently, he is a PhD Fellow at the Centre for Information Technology and Architecture (CITA) in Copenhagen Denmark. His current research focuses on the use of computation and parametric design tools in architectural practice. Originally from Canada, Brady Peters has a MArch from Dalhousie University and a BSc from the University of Victoria. In London he worked for Buro Happold and in 2003, he joined Foster + Partners, where he was a key member of the Specialist Modelling Group, and became an Associate Partner. He has taught architectural design at the Royal Academy of Fine Arts School of Architecture in Copenhagen, the University of Ghent, the University of Nottingham and has been a tutor at almost every SmartGeometry conference.